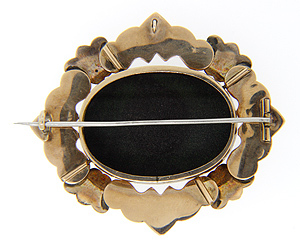 The detail on the 14K rose gold frame of this Biedemeider brooch is simply stunning. 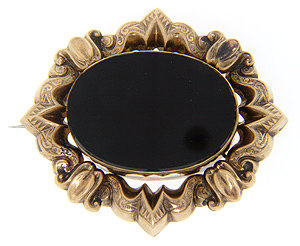 A piece of highly polished black onyx holds the center of the pin. The frame is exquisite and in pristine condition. The piece measures 2 3/8" by 2" and still has the original "C" clasp. Circa: 1810.